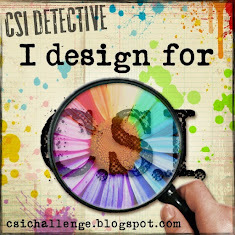 I only came across this challenge yesterday, but it looks really fun and inspiring so I'm going to give it a go - only trouble was, I only have a couple of hours this morning to come up with something in order to make the deadline for entries and now I have to post it quickly as we have unplanned visitors turning up any minute! EEEK! The challenge is to create something (anything) using the suggested colours which are all icecream flavours - this week it was "Rainbow Sherbet" and next week is "Mint Choc Chip"
Here is my somewhat rushed attempt - also my first ever ATC! I will try harder next week - that's a promise! Ok I've had another play with these colours - still not quite happy with it but I'm enjoying the journey and that's the important thing! Sometimes I work better under a little bit of pressure knowing that I have to get something finished by a certain time. 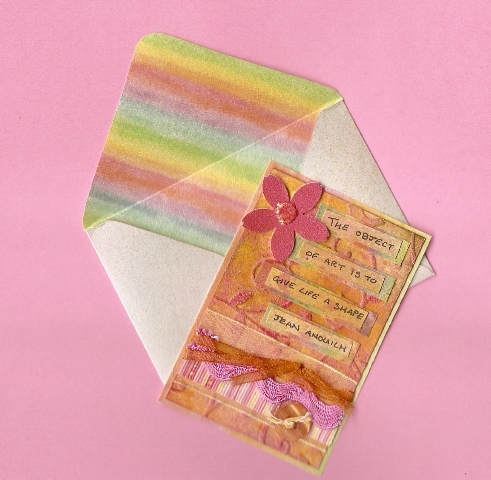 Never would've known this was a last minute job :) Love the rainbow envelope! Perfect colours of summer! Great job! They are so, so pretty - just love the delicate colours and all the little bits of ephemera you chose. And amazed you did them in such a short space of time - I 'm impressed! what lovely ATCs! 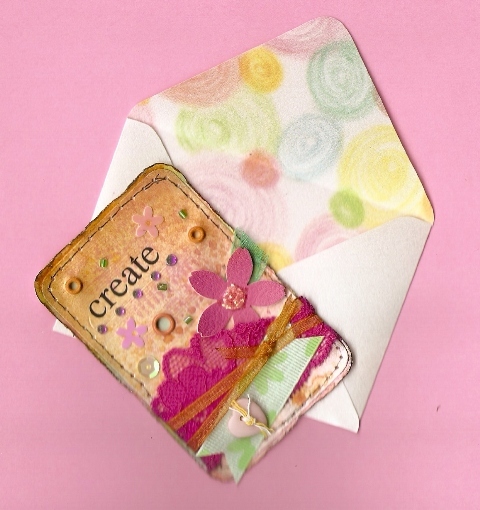 i specially love the create ATC! well done! I think you've made a great start! !